I am watching football as I write this. That might be a bad idea. I am reduced to multi-tasking because life has been just so hectic lately–as it is every October, really. Between various birthdays, annual autumnal celebrations, cleaning for my in-laws visiting, Halloween and, well, stuff, I seem to always be gasping for air in October. And I suppose it does not help that every Saturday everything must stop for me to watch my beloved Michigan Wolverines (honesty compels me to acknowledge that my husband would say hell no it doesn’t help. He is not a football fan.). Right now the Michigan band is marching and I have preliminary goosebumps. When the players run out of the tunnel and jump to touch the GO BLUE banner, that is when I get really serious goosebumps. Weirdly, I was not such a huge fan when I attended Michigan. I went to the games, of course, but I was a diehard NFL fan and I lived and breathed the Cleveland Browns. But the Browns left for Baltimore, breaking my heart, and as I myself moved around (the northeastern quadrant of) the country, I discovered my alumnae loyalties traveled with me far more easily than did my loyalties to a city without a football team. By the time the Browns came back, all that remained was a loyalty to the Cleveland Indians, and I was completely and officially a big college football fan. And basketball. And (ice) hockey. I think maybe she just likes leveling ingredients with a knife! 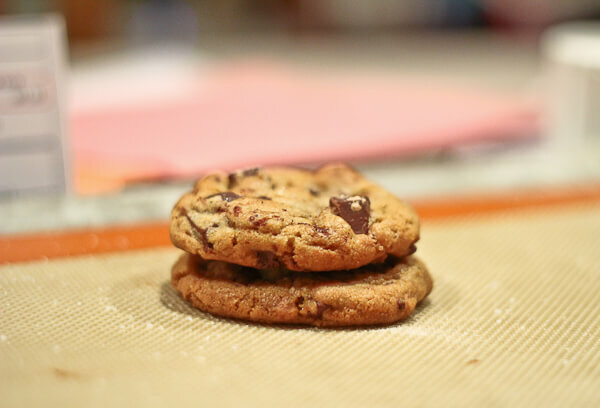 The browned butter is really delicious in these cookies. Somehow it grabs hold of the essence of what makes a chocolate chip cookie a chocolate chip cookie–that buttersctoch vanilla flavor–and just makes it more so. And if you let the cookie dough rest the texture is fantastic. I don’t care what the instructions say, always let a drop cookie dough rest before baking. At least an hour or so, but really preferably overnight. That’s how you get that fantastic crispy on the outside, chewy on the inside, super thick cookie. I should add here that I have several browned butter cookies coming up to share with you–this is the first–and with each cookie I have become better at browning the butter. I have decided the key is to whisk or stir constantly, which I did not do here. Don’t get me wrong, these cookies set a pretty low bar for the successful browning of the butter, i.e., they will be great even if you don’t do a perfect job. But I have learned to get the butter even more consistently reddish brown, with no dark brown spots, and the key is constant attention and whisking. Keep scraping those bits off the bottom of the pan! As long as I am (kind of) on the topic of secrets to perfect cookies, in addition to letting the dough rest, do not overcrowd the pan. I know it is more work, as it takes more rounds in the oven, but I have decided 6 cookies per pan is (almost always) the perfect number. As is the size above, about 2-3 tablespoons worth of dough. 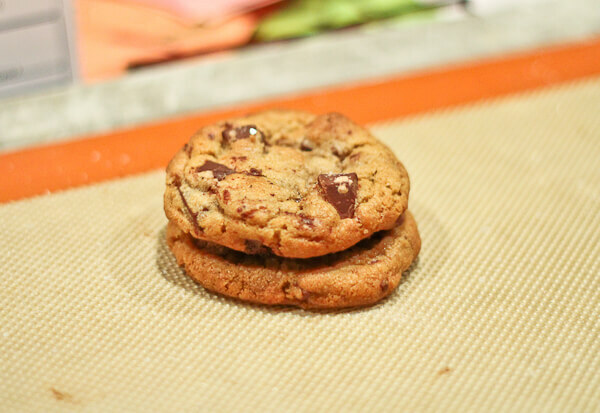 Smaller than a giant 1/4 cup bakery style cookie, but big enough to have some heft, thickness and chew. And at 6 balls per pan, each cookie gets plenty of heat circulation above and around it. Why do I have this niggling feeling you want me to shut up already and share this amazing recipe? 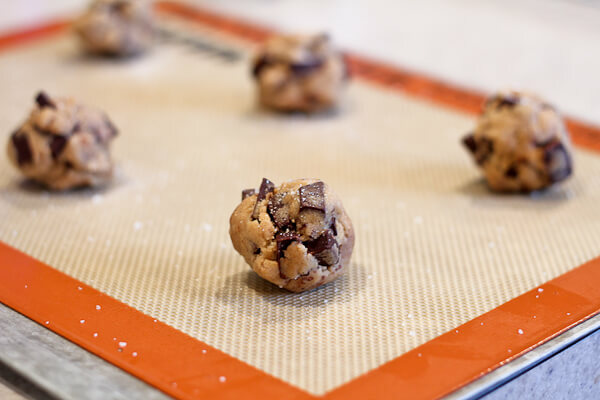 I found the recipe at eat, live, run, and my only adaptations were as I described above, letting the dough rest and baking 6 cookies per sheet. And to sprinkle each cookie with coarse grey sea salt. I used Scharfen Berger’s semi sweet chocolate chunks. These cookies do look pretty amazing. 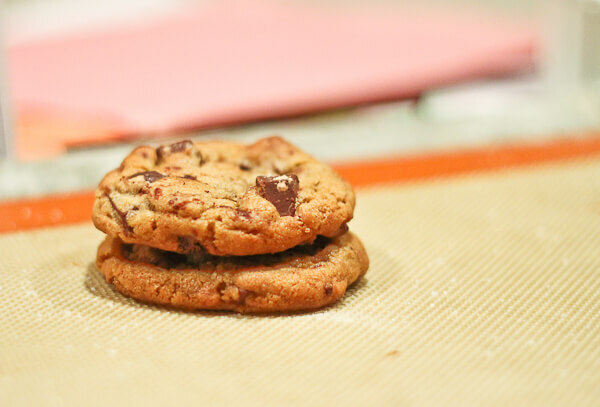 Salt + brown butter + chocolate chunks = delicious! What’s not to love about these cookies? How yummy. 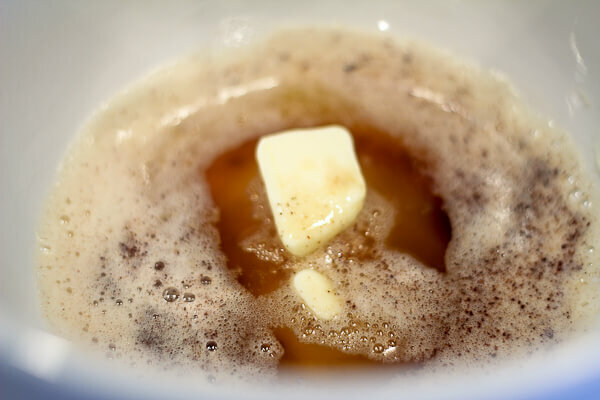 I still haven’t jumped on the brown butter bandwagon yet and I rue that fact every day! I need to get on it. The cookies look so delicious but why salt and not sugar? There is sugar IN the cookie of course. The salt plays off the sweet caramelized notes and the chocolate itself in a way that is hard to describe but ends up making the whole thing better. I HIGHLY recommend trying it! 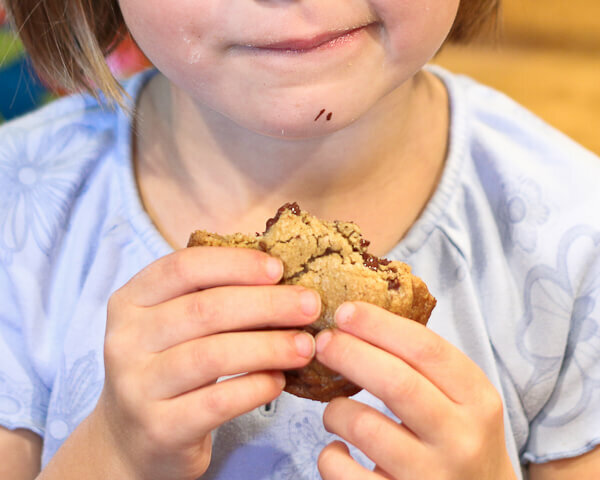 There’s nothing that makes me happier than seeing someone bite into a chocolate chip cookie and really get in there! 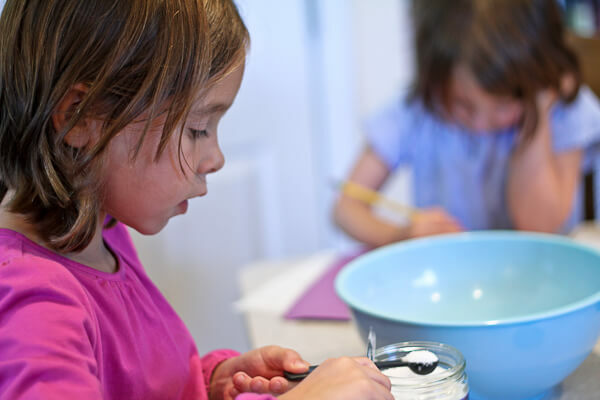 Chocolate on your fingers and hands it the way to go – who cares what other people think? Enjoy that cookie! The browned butter sounds awesome, too. Oh yum. What else is there to say? Great recipe! Oh what I would give for one of those beauties to pair with my cup of coffee right now! YUM! 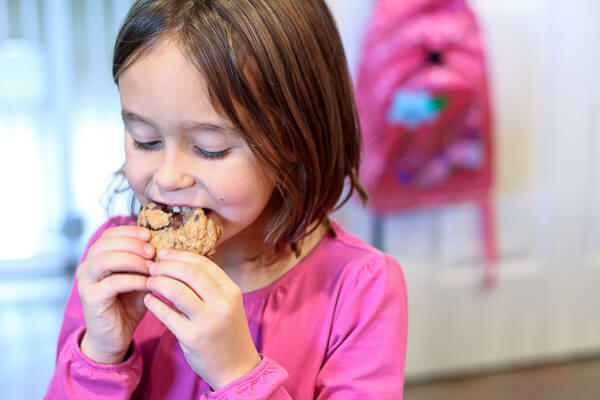 chocolate chip cookies have nothing on chocolate chunk cookies–there’s a whole different level of tastiness (and messiness–you WILL have chocolate on your face!). i finally watched the arrow pilot and loved it, probably because steven amell is a perfect physical specimen. 🙂 did you watch mockingbird lane? i thought it was good fun.